Branded product pages on the digital shelf have become incredibly important both as a sales and marketing channel. For that reason, most brands are putting time and resources into improving the content of their product pages. But how exactly does content impact the numbers every business relies on? 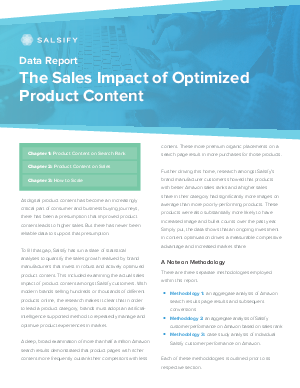 Read this report to get deep statistical insights on how product page content impacts search ranking, online market share, and sales overall. Salsify is the product experience management platform for thousands of brands and retailers worldwide.